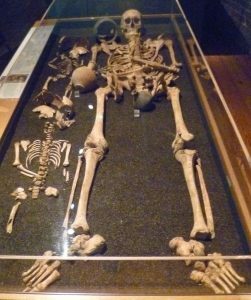 I recently visited the excellently-presented exhibition: Roman Dead: death and burial in Roman London at the Museum of London Docklands. I knew that Romans were taught to face death unflinchingly and expected to be stoical, but, wandering round the exhibition I began to question this. I came to the conclusion that, in spite of their general bloodthirstiness as far as death in the arena or wholesale slaughter on the battlefield went, the Romans had a surprisingly uneasy attitude towards death on a personal level. Death was seen as polluting, and the house where a person had died became a polluted space. Until the proper burial and cleansing rites had taken place, the dead person’s soul could not rest in peace. And an unquiet soul who was vengeful or upset could seriously affect the living. Teenage boy buried with a baby and a 4-year-old child, probably his siblings. Research shows that he was brought up in a Mediterranean country. 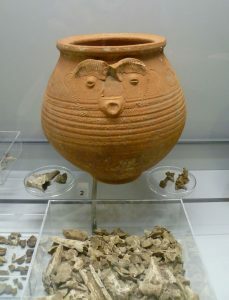 Unusually, there are a few grave goods like the pottery jar. Justa facere, that is, doing the right thing was crucially important if the dead person were not to haunt his former home and lay a curse on the living. If the actual body was missing – the dead person may have died abroad, say – then an empty tomb was used for the funeral rites, instead. In early Roman times, the dead were buried outside their village or town but, as the population expanded, that became more difficult, and cremation gradually became the norm. Even so, a small part of the body itself still had to be buried. 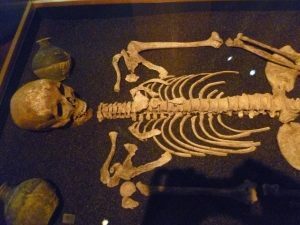 In Roman Londinium, archaeologists have discovered both types of burial, and a large variation in funeral practices seems to have been acceptable. Every Roman knew that Julius Caesar’s vengeful ghost appeared to one of his assassinators, Brutus, the night before the fateful battle of Philippi, when Brutus was killed. So the correct following of ceremonial funeral rites was crucial if the dead were to rest in peace. The first ceremony was the Conclamatio, (crying aloud in grief) when the eldest son called out the name of the dead person and the mourners replied, ‘Conclamtio est!’ The body was then washed, anointed with various oils, dressed in formal wear – a toga for men, a stola for women – and laid on a funeral couch with their feet facing the door. Flowers were strewn round and incense burned. Pine and cypress branches, both symbolic of death and pollution, were laid around the door – which was seen as the Pomerium, the ritual boundary between the world of the living and the dead. Traditionally, an obol (a small coin) was placed in the deceased’s mouth to pay Charon the ferryman to row the dead person’s spirit across the River Styx to the Underworld. 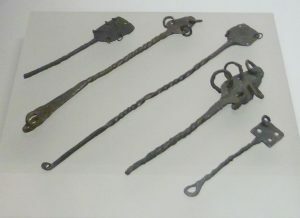 Most Romans were buried with no grave goods but, occasionally, London archaeologists find something, a bracelet, for example, or, perhaps ear-rings. One child’s grave contained a chicken skeleton, together with a small jar which may have held food, and a jet ring. Jet was thought to have powerful protective qualities which would help the child to get safely to the Underworld. Funerary procession rattles. 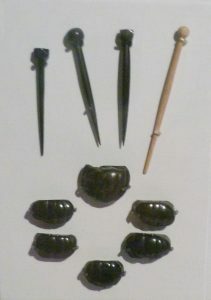 These are like small versions of a sistrum, a musical percussion instrument used to summon a goddess which has a high, clear sound. The replica in the exhibition which visitors were invited to shake, just sounded clunky. Powerful people usually rated an elaborate funeral procession with musicians, singers, professional mourners and funeral orations as their funeral couch was carried to the city cemetery and laid to rest in an elaborate tomb with yet more ceremonies to ensure that the mourners and the family home were purified. As I walked round the exhibition, I increasingly got the feeling that there was a high level of anxiety in Roman society around the burial of the dead. The Londinium skeletons are ethnically diverse. Isotope analysis has shown that this woman was of Black African origin. The usual period of mourning was nine days, followed by the cena novemdialis, the ceremonial meal eaten on the final day. Of course, if you were really famous, the mourning could go on for much longer. Excavations in London have produced a number of interesting sarcophagi and memorials to the dead, but nothing – yet – has been found which can compare with the tombs of the rich and powerful one can see in Italy. The one pictured below certainly makes a statement about the occupier’s importance. 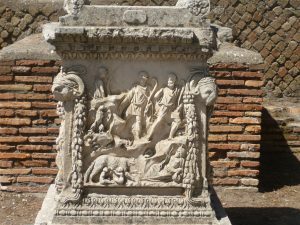 An elaborate family tomb depicting Rome’s founding legend of Romulus and Remus. Ostia. And the cena novemdialis wasn’t the end of it. Every year, from the 13th-21st February, a Roman family celebrated the Parentalia when they made offerings at the family sarcophagus and local temple to ensure that the departed would rest in peace and not trouble the living. The Parentalia ended with the Feralia, the Festival of the Dead. 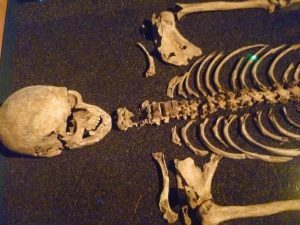 Roman Dead: death and burial in Roman London is on at the Museum of London Docklands until 28th October. Entry is free, and I recommend a visit. It has a nice café, too! Rather macabre exhibition, but fascinating nevertheless. I know very little about the Roman traditions of death so this was really interesting. I had no idea about the purification, though I did know about paying Charon to row you across the River Styx. I wonder how akin to Greek traditions this would be? Thank you for your comment, Elizabeth. I don’t know the answer to your question but I do know that archaeologists don’t always find obols in the mouths of London skulls. Maybe it was more common among those who had had a Classical education, or who were of Italian origin; after all, an obol was a Greek coin of very little worth.